What’s New on the SFBAC History site? In the early 1960's former United States Senator William F. Knowland chaired a study commission representing the nine bay area councils regarding a plan to merge all of the Scout Councils of the Bay Area into one large council. The councils involved were: Alameda Council (Council #22, organized 1917), Marin Council (Council #35, organized 1923), Mt Diablo Council (Council #23, organized 1951), Oakland Area Council (Council #21, organized 1916), Piedmont Council (Council #42, organized 1921), San Francisco Council (Council #51, organized 1917), Santa Clara Council (Council #55, organized 1929), San Mateo County Council (Council #20, organized 1932) and Stanford Council (Council #31, organized 1940). Most of the nine Bay Area Councils disapproved of the merge indicating it would do more harm than good for the scouts and the councils. Of the nine councils, only the Oakland Area Council and the San Francisco council voted in favor of a merge. Between the two councils, the San Francisco Council was smaller and was less financially stable than the Oakland Council. However it still made sense to merge the two councils into one larger council that could better support the needs of the Scouts. It is interesting to note that in 1911, 52 years before the two councils would merge and only one year after the Boy Scouts of America was founded in the United States, the first combined outing of the Oakland Scouts and the San Francisco Scouts took place in the hills of Oakland near Montclair. One of the games that was played during the outing according to an article in the Oakland Tribune was “a war game where one group will try to surprise the other group”, these days that same game is known as Capture the Flag. No doubt the two organizations had a close relationship since the start of Scouting in the Bay Area. Jump forward 50 years to Monday February 10, 1964 atop Yerba Buena Island as the proud old blue-and-gold flags of the Oakland Area Council and the San Francisco Council were lowered and retired for the last time. The retired council flags were folded and presented to Robert J. Matheison and Raymond Marks former Presidents of the Oakland and San Francisco Councils respectively. In their place, the two councils dedicated the new San Francisco Bay Area Council flag in a ceremony which united 30,000 Bay Area Scouts into one cohesive unit for the first time. The ceremony, pining the San Francisco Council and Oakland Area Council, was held atop Tower Hill on Yerba Buena Island, a point midway between the two cities. As the new flag, bearing the names of both cities was unfurled, Thomas Williams of the Oakland Area Council and Bill Rothschild of the San Francisco Council tied a big square knot in a hawser to symbolize their unity. About a week earlier on Wednesday, January 29 a preliminary meeting of the officers was held at the Bohemian Club in San Francisco. This meeting was held to discuss certain items that needed consideration prior to the first official meeting of the new Council such as insurance issues, personnel issues and board nominees. At 7:45 pm on the evening of February 10, BSA Region 12 Chairman Edward Mills called to order a meeting of nearly 500 volunteer Scout leaders at the Edgewater Inn in Oakland’s Jack London Square. At this meeting the voting membership elected Arch Monson Jr as the new board President of the San Francisco Bay Area Council (SFBAC, Council #28) as well as eighty-six other board members and officers. Harvey Price was selected as the first Scout Executive of the council as Price had been the former Scout Executive for the San Francisco Council. Frank Dix, who had been the Scout Executive of the Oakland Area Council was named to a National Council position and moved to Florida. With the adjourning of the meeting, the San Francisco Bay Area Council was officially formed. Both of the former Council Service Centers continued to be utilized to serve the Scouts of the new merged Council. However the Oakland Council office at 655 East 14th street in Oakland was used as the official headquarters of the new San Francisco Bay Area Council. The history of the San Francisco Bay Area Council cannot be told without first going back to October of 1899. For it was that year during the Battle of Mafeking at the Northern tip of Cape Colony in South Africa that Colonel Robert SS Baden-Powell of the British army used his skills as an army scout to hold the city of Mafeking against 7500 Boer warriors for over seven months until a British relief party could arrive. During this time Baden-Powell made numerous Scouting expeditions outside the city almost every night and organized the first band of “Boy Scouts” in the British Army. This purely military conception of the Scout that Baden-Powell had in mind gave way about eight years later to the broader and finer ideals of training boys through techniques in scout craft. In 1906 Baden-Powell now a Lieutenant-General and very well known in England had met American Ernest Thompson Seton as well as Daniel Beard who both had ideas regarding boys and the outdoors. Baden-Powell had read Seton's book, The Birch Bark Roll of the Woodcraft Indians, and was greatly intrigued by it and the two men shared their ideas about teaching boys outdoor skills. A year later in August of 1907 in Southern England on the island of Brownsea and seven miles from the English Channel, Robert Baden-Powell held a scout encampment which was attended by 21 scouts. During this week long encampment Baden-Powell taught scout craft and other scouting skills to the boys. The Brownsea encampment is recognized as the world's first Scout camp and is regarded as the origin of the worldwide Scouting movement. In 1908 Baden-Powell released his “Scouting for Boys” handbook that taught the skills of scoutcraft and the patrol method developed at Brownsea. 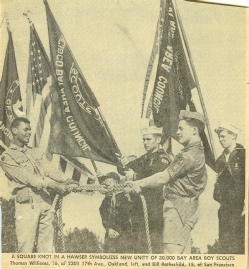 The Scouting for Boys book has been used as the basis for many Scout handbooks around the world including the Boy Scout Handbook used here in the United States. While passing through England on an expedition to Africa, Chicago businessman William Boyce had stopped in London for a meeting. In the thick morning fog of London, Boyce got disoriented and lost his way. A boy saw that Boyce was lost and asked if he could be of help. Boyce explained that he had an important business meeting to attend. The Scout offered, "If you'll give me the address I'll take you there." In return for his help Boyce wanted to give the boy a token for his appreciation, but the boy declined the offer. When he asked why, the boy replied, "Because I'm a Scout!" the boy explained. Later that day Boyce went to the Scout headquarters to meet Lieutenant-General Robert Baden-Powell, the founder of the British Boy Scout movement. Boyce had an extended meeting with Baden-Powell who explained his Scouting program to him. Boyce was so impressed with the potential of a Scouting program for America that when he returned to America he brought back a trunk full of Scout literature, uniforms and insignia to America. Boyce had many dealings with boys, but nothing had impressed him as much as his first encounter with the unknown Boy Scout in the London fog. A soon as Boyce returned home to Chicago from his expedition, he began working on an American Scouting organization. He discussed the idea with his friend, Colin H. Livingstone, of Washington, D.C., and with other people in Washington. Livingstone would later become the President of the National Scout Council. Only four months after his foggy encounter with the unknown Scout in London, William D. Boyce incorporated the organization, choosing Washington, DC, rather than Chicago to emphasize its national character. It was in Washington that the Boy Scouts of America was incorporated on February 8, 1910. The stated purpose of the Boy Scouts when the organization was incorporated was to teach (boys) patriotism, courage, self-reliance and kindred values. These values have changed little in the 100 years since its incorporation. Later that year President Theodor Roosevelt placed his seal of approval on the Boy Scouts of America on September 23, 1910 at a banquet honoring Robert Baden-Powell by stating, "I believe in the movement with all of my heart". In March of 1912, World Scouting founder and leader Baden-Powell along with Chief Scout Executive James West on a promotional tour of the United Sates met in San Francisco at the Palace Hotel to discuss with Bay Area Scout leaders the Scouting movement. The fledgling Scouting movement was growing fast and furious across the Country.